Of the many lost classics produced during the creative explosion of the late '60s psychedelic heyday, the greatest may be the third album by the Los Angeles-based group Love. In its startling originality, its elaborate use of symphonic orchestrations and its nods to the vast canon of music that preceded it, "Forever Changes" is everything that's been claimed of 1967's most heralded rock release, the Beatles' overrated "Sgt. Pepper's Lonely Hearts Club Band." But while it has its optimistic moments, its overall vibe is far bleaker and much less hopeful than the hippie ideal of "All You Need Is Love." Arthur Lee, Love's key songwriter, primary singer and driving force, was an African-American who never subscribed to the flower children's sunny visions. Ravaged by the tensions of the Cold War, the slaughter in Vietnam and the riots in the streets of America's biggest cities, the world that he chronicled was no utopia, but a dark and sinister place where the occasional ray of light nonetheless managed to penetrate the gloom. From the beginning, Love thrived on the combination of two mismatched songwriters. Born in Memphis, Lee was raised in L.A.'s tough Crenshaw ghetto. Strongly influenced by Mick Jagger, he presented what pioneering rock critic Lillian Roxon called "an amusing paradox," an African-American singing like a white Englishman singing like an old African-American. In contrast, Lee's partner Bryan MacLean was the son of a Hollywood architect who grew up swimming in his neighbor Elizabeth Taylor's pool. His first girlfriend was Liza Minnelli, and he was raised on classical music and Broadway standards. "You hear more of my influence on Arthur than his influence on me," he told the journalist Alan Vorda in the book Psychedelic Psounds. "What you have [in Love] is a black guy from L.A. writing show tunes." In 1966, Love bowed with a memorable self-titled album that opens with a snarling, speed-freak version of "My Little Red Book," a Burt Bacharach-Hal David tune from the soundtrack to "What's New, Pussycat?" It became a minor hit and established the band as too-cool hipsters; the album cover featured the quintet scowling like angry young poets and fashion models posing before a broken-down chimney in a fire-gutted mansion that was said to have belonged to Hollywood's Dracula, Bela Lugosi. The cover of "Da Capo," the group's second album, found an expanded sextet back at the same site. The sounds were becoming much more expansive as well, introducing an element of the baroque that would flourish fully on the band's third and best effort--a departure indicated by a radically different cover: A colorful drawing of the musicians' huddled heads, it recalls the similar images on the Beatles' "Revolver." By 1968, Love was starting to fall apart as some of the band members turned from the casual use of psychedelics to harder substances such as heroin. Lee was also becoming increasingly bitter that the group had failed to hit the heights achieved by labelmate Jim Morrison, and he blamed prejudice. "I wasn't gonna go eat garbage like the Doors did," he told the Bob fanzine in 1994. "And then, too, I wasn't white. The cold fact of the matter is birds of a feather flock together." Though he was only 22 at the time, the band's leader had become increasingly fatalistic, convinced that he was going to die and that Love's next album would be his final testament. (The back cover shows the singer standing with a cracked vase full of dead flowers.) Knowing that he couldn't compete with the searing electronic sounds of his friend, Jimi Hendrix, who had begun his ascent to superstardom, Lee decided to pare down for a quieter, more introspective sound. The group recorded acoustically, sitting in a circle as if jamming in the living room. The tracks were augmented later with tasteful orchestrations evoking the varied sounds of life in L.A., from spicy mariachi horns to lulling strings to dissonant guitars that bring to mind the strangling and ever-present traffic. "The funny thing about [recording] that album--there's a full orchestra [when] I walk in," Lee says in the liner notes to Rhino's 1997 reissue. "With the way I looked [and] the way I dressed, I was sitting there for about an hour before they figured out who I was! It was quite amusing, 'cause I wasn't going to tell them anything." As singers and songwriters, Lee and MacLean could more than hold their own in the company of musicians from the L.A. Philharmonic, and session greats such as Hal Blaine and Carol Kaye, who started out playing on some of the tracks before Love bassist Ken Forssi and drummer Michael Stuart pulled themselves together to finish the disc. MacLean contributes only two songs, "Old Man" and "Alone Again Or," but they are integral to the album. The latter, which opens the record, is a tribute to his mother's flamenco dancing, punctuated by a trumpet solo that brings to mind the Tijuana Brass (producer Bruce Botnick was also working with Herb Alpert at the time). At first blush, the driving and catchy number seems to be a love song, but the narrator scoffs at the hippie notion that he "could be in love with almost everyone." In the end he remains "alone again tonight, my dear." Lee is even more cynical. He lampoons the psychedelic culture by chronicling its ugly realities ("Live and Let Live" opens with the line, "Oh, the snot has caked against my pants," which Lee wrote about waking up after a night zonked out on drugs). "The Red Telephone" takes its title from the nuclear hotline allegedly set up between Moscow and Washington, D.C.; the propulsive "A House Is Not a Motel" contemplates an unspecified holocaust ("And the water's turned to blood/And if you don't think so, go turn on your tub"), while another track is unambiguously titled "Bummer in the Summer." "While the music of 'Forever Changes' flows with an almost narcotic consistency and deceptive prettiness, the words can be like an itch that you can never quite put your finger on," critic Ben Edmonds wrote. "The combination is thoroughly captivating and slightly unsettling--psychedelic in the truest sense." Witness "The Red Telephone," the album's centerpiece and most striking studio creation. The tune builds from a quiet ballad to an otherworldly and somewhat paranoid nursery rhyme about an Orwellian world where unnamed forces stamp out any trace of individualism. "They're locking him up today/They're throwing away the key/I wonder who it will be tomorrow/You or me?" Lee chants as the song builds to its climax. "We're all normal and we want our freedom," another voice responds, but it's never quite clear who prevails. 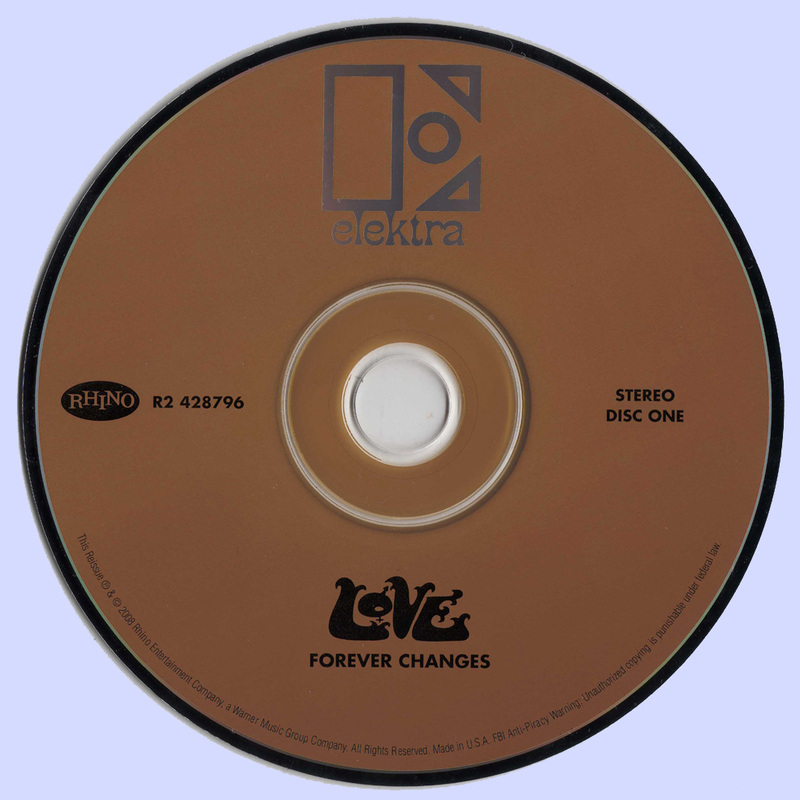 MacLean quit Love after "Forever Changes," which was a commercial disappointment upon its release (though in the decades that followed, it would eventually reach gold-record status). Lee made several more albums with a new version of the band, including "False Start" (1970), noteworthy primarily for a guest appearance by Hendrix. He dropped out of the music scene for much of the '70s and '80s, while MacLean went on to write songs for the likes of Debby Boone, Patty Loveless and his sister, Maria McKee, until he died of an apparent heart attack in 1998. Lee's failure to produce much worthwhile music after 1968 has prompted some critics to put him in a class with cracked psychedelic geniuses Syd Barrett, Brian Wilson and Roky Erickson. In the mid-'90s, he was sentenced to 12 years in federal prison, thanks to California's "three strikes you're out" legislation, which qualified a string of relatively minor incidents as felonies. 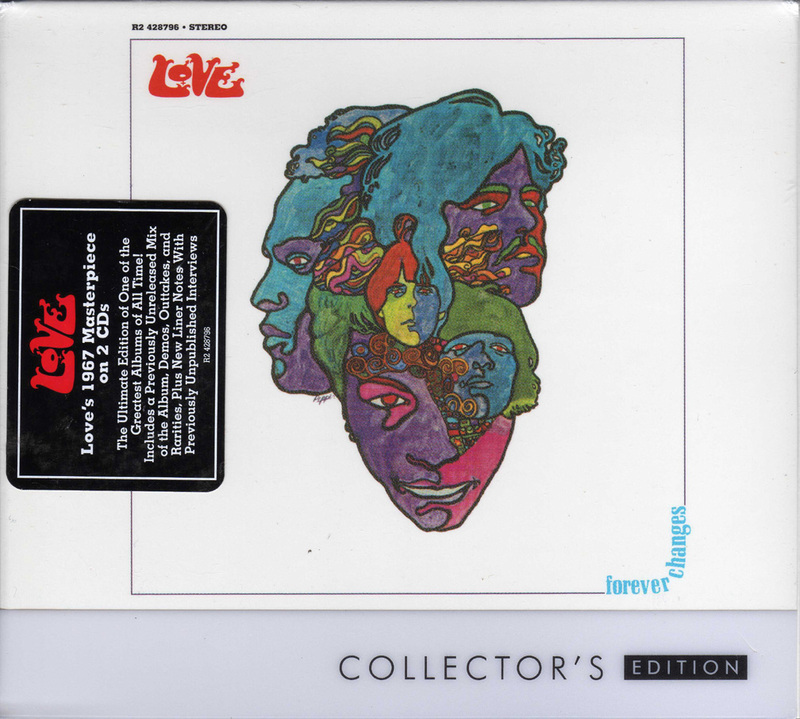 While Lee is talking about recording new material, it's likely that Love's third album will remain his crowning achievement--the enduring testament that he envisioned 45 years ago. 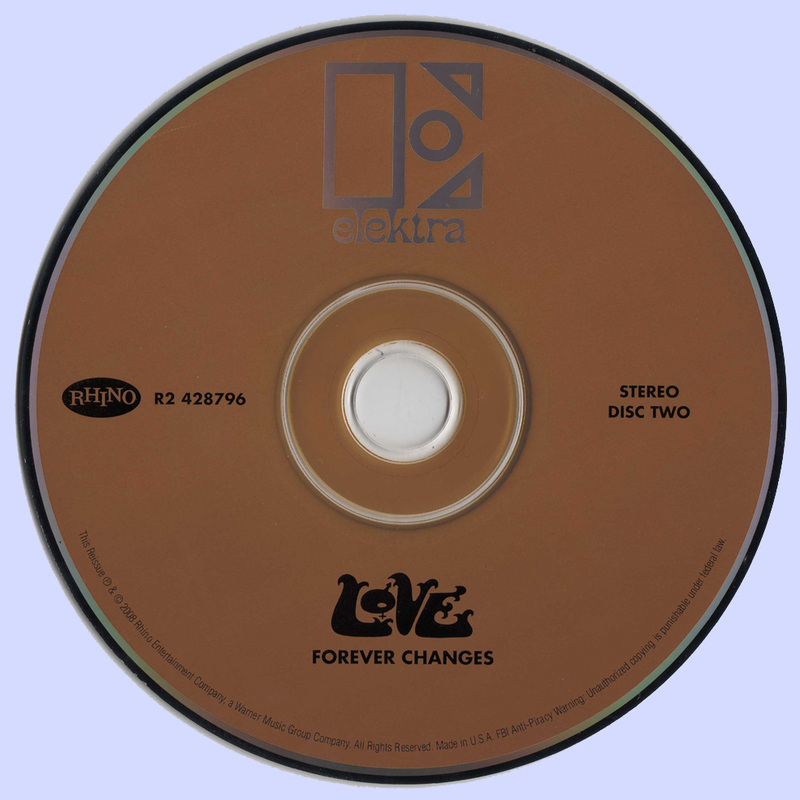 "'Forever Changes' were my last words of Love," he told Creem magazine in 1981. "My last words to the world, only I've been here ever since. Just like a guy saying goodbye, and you look out your front door, and he's still there 15 years later." 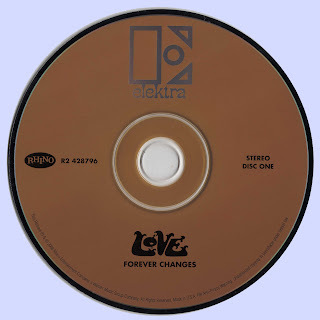 Hi Marios, I have the 87 Elektra CD, but for one reason or another forever Changes failed to appeal to me. The same with Da Capo. Maybe I should give it another (last) try and listen to this digipack edition before discarting it all together. Thanks for sharing, man!